Recovery Sports Grill is located in Burlington County, and just so happens to be near a friend of mine. Some time not too long ago, that friend and I popped into this sports themed restaurant to see how their wings fared. Everything was going great until good conversation and many pints pushed my wing tasting to the back seat and ultimately got lost in the night. So when the time came where I found myself back in that same area (this time with family), I didn’t hesitate to return to the Recovery to finish what I started. Inside reminded me of a chain restaurant/bar with its many booths and high top seating, yet had a personal charm more like a family owned establishment. Not short of any other sports bar, big screen TVs line every wall along with other sports memorabilia that seemed to each have a well thought out place. My favorite part about those TVs, which is definitely worth mentioning, was that there was NO VOLUME. This is important to me because I am not a big sports fan. I like to have fun playing sports, but I don’t necessarily like to watch other people having fun playing sports. So when I’m in a sports bar where I can conduct a conversation without battling multiple sounds from the surrounding TVs, it’s a good deal. The way they work this is by having a Soundog speaker system on each table that has buttons which correspond to the numbered decal on each TV. So if you want to hear the audio from TV #1, simply press that button on the Soundog and voilà… you have sound, dawg! (get it?) And though I geek out when it comes to all things technological, I’m really here for my other passion: wings. So let’s get to it. The menu has two pages dedicated to wings. With everything from bone-in and boneless, or fried and grilled, to the many varieties of sauces, there was plenty to choose from. Lucky for me, they had a 5 count available so I could break up my meal of 10 into half fried and half grilled. I had them both tossed in Medium sauce to see how they differ from cooking methods alone, but I also got sides of Hot and Maple Adobo for good measure. So with all those options AND with my wife ordering their boneless tenders tossed in Thai Peanut sauce, I had a lot to sample. My wings came out looking great. 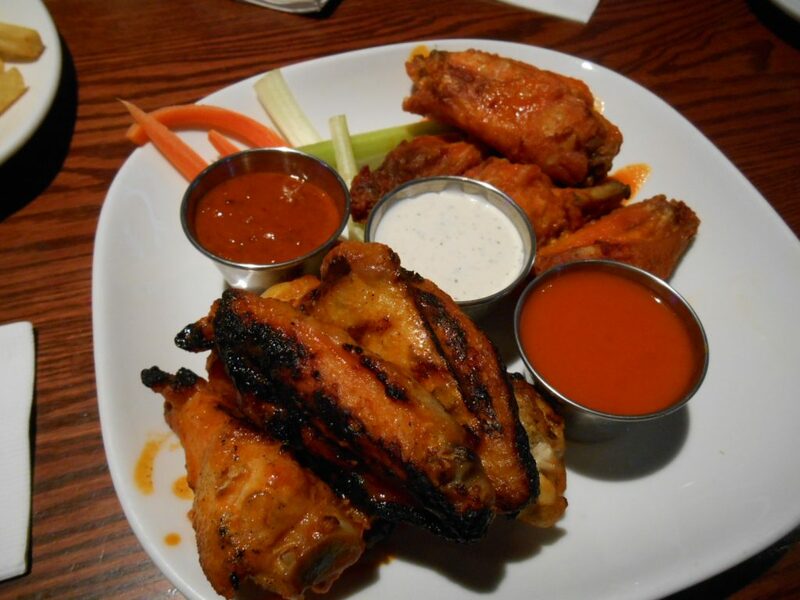 They split the wings with celery, carrots and blue cheese to keep the fried on one side and the grilled on the other. The Medium sauce that I ordered was simply Frank’s RedHot. It was no surprise to me because the Recovery Sports Grill doesn’t hide the fact that their sauce is Frank’s, they shout it from their menu and from the little Frank’s bottles on every table where ketchup would normally be. I bit into the fried wings first to find a juicy chicken underneath. The meat was tender, and I could taste the sauce because the way it was cooked left no other imprint of flavor besides oil. This was not the case with the grilled wings, however. Like a good grilled wing, you get a little char on the skin that adds a smoky flavor to the overall wing. But in this case, there was just a bit too much char for the Medium sauce to handle. Frank’s alone cannot balance out that smoky flavor, and I kept getting a burnt taste in my mouth that could’ve been muted a bit if it was mixed into some sort of BBQ or honey glaze. That way I could get the heat from the Frank’s balanced with a sweeter coating that would allow me to taste the char but not get overwhelmed by it. Needless to say, I favored its fried counterpart and returned to that side of the plate to finish tasting my sauces. The Hot sauce tasted exactly the same as the Medium with little or no heat improvement, so I didn’t really see a difference there. Next in line was the last listed on their menu, toward the Hotter side of the scale, leading me to believe that their Maple Adobo would leave a mark. It didn’t hit me with the heat that I was expecting, but it did leave me with a pleasant surprise. Normally I dislike chipotle flavors because smokiness in a sauce is not my cup of tea. But just like I said about cutting the smokiness of the grilled wing with a sweat glaze, this sauce did that by integrating the maple syrup. It took the edge off the chipotle flavor and made it more tolerable to eat, unlike the many chipotle sauces I have tried in the past. So kudos to them for that. And with the last dip of sauce, I finished up both sides of the plate and invaded my wife’s to see what the boneless tenders had to offer. The boneless tenders in the menu looked awesome with that flaky crust and meaty chicken. These come in counts of 4, 7, or 15 and she ordered the smallest version, which was all she needed because when they came out we saw that each piece was huge. The only difference from the photo on the menu and what was on her plate was that her’s tended (no pun intended… oops just did it again) to be a little over cooked and the breading, though crispy, was a little LESS flaky. On the flip side, the Thai Peanut sauce was delicious. I’ve had plenty of peanut based sauces before and usually they all fall more in the Peanut Butter category because they lay it on thick with the peanut. But this one took them all on by allowing me to taste the peanut flavor without overpowering the sauce. If getting this dish, it might be a good idea to ask for extra sauce, because these guys are packed with so much meat that you need to douse them again to appreciate the flavors. In the end, the Recovery Sports Grill is a clean, friendly, fun place to stop in and grab a bite to eat. The wing selection is huge with many options from cooking style to sauce variations. The specialty sauces seem to be where they spend most of their creative time, and I guess I would like to see that same attention be brought to the classic Buffalo sauces. I know they use Frank’s and that’s fine, but when I look for a great wing place, I look for a bit more creativity. Take the Frank’s RedHot as a base and go a bit further with some custom ingredients to really make it your own, rather than straight from the bottle. But if you do go this route, I would recommend getting the traditional fried wings as the grilled ones will overcome the sauce. If you are in it for other flavored sauces, such as Garlic Parm or Sweet BBQ however, then this may be the place for you.